A few days ago a friend of mine asked me to go online and check out a new CD the band he was in had just released. I quickly pointed my web browser to the CD Baby website to give a listen to a buddy whose cover band has been tearing up the local watering holes around town for years. Finally getting to hear his own original music was really going to be a treat. CD Baby is a gold mine for independent artists. A website most local and regional bands use to promote their new music. It’s a great way for unknowns to get the word out to people who may not even know who they are. But I never would have guessed that the CD Baby platform would ever be used in the opposite way. Case in point: While listening to my boy’s uptempo bar songs I happened upon a CD listing for a band whose name sounded familiar to me. 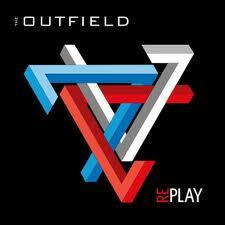 The album for sale was called “Replay” and the band was “The Outfield”. “The Outfield?? It couldn’t be”, I said to myself. But by checking the band description it didn’t take long to realize that yes, this “Outfield” was the exact same Outfield who had been all over radio and MTV and sold five million records thirty-two years ago. Riding a stream of hits including “Say It Isn’t So”, “For You” and “Your Love” (a song which ironically has been in the set list of my buddy’s band for years). What the hell were these guys doing on CD Baby? I gave a listen to some of the preview tracks just to verify that this was the band whose catchy hooks were a staple of the mid 1980’s. The new songs I heard were actually quite good. Just as good if not better than some of the ones I had heard from them during the Reagan administration. Music that brought back memories of blaring boom boxes, feathered hair and childhood summers. Music that, in my opinion, should now still be played on Top-40 radio and what ever the alternative is for MTV. Sadly, there was no point in me picking up the phone and calling the local radio station to request California Sun, a track from the new record. Although it would personally be cool to request “The Outfield” again what were the odds that the DJ on the other end of the line would even know who this band was? Now, had I said Bruno Mars, Katy Perry or Taylor Swift it would be a different story. There is a plethora of songs to choose from there. “Music” that saturates radio today. Song by artists that quite honestly are completely interchangeable with each other. All manufactured with the same chords, the same beat and the same theme. The only difference being the actual lyrics of the song and even most of those are cliché’. I don’t know about you, but I’m tired of hearing about skies full of lighters, a drunk party or crying out in the yard at two in the morning because my boyfriend broke up with me. They only make me long more for the days of Josie being on a vacation far away. Music isn’t created anymore, its manufactured on an assembly line. The songwriters are gathered together with ideas already in place by the suits at the record company and the music is programmed in a high-tech studio in some big city. It makes me wonder how many actual musicians are playing their instruments on these tracks. Finally, it’s all put together, packaged and backed by a gigantic marketing team with deals already in place with major suppliers. The days of the public deciding what music is good and bad are over – companies now tell you what you should buy and price their product appropriately. Want proof? Just check out in stores and digital downloads. Ever notice that some new digital music singles sell for 30% less than standard 99-cent rate? And new CDs, for certain popular artists, which normally sell for $13.99 at a store, sell for $7.99? Not coincidence. It’s no longer about the music or how much money sales generate, it’s only about how many physical units are sold. Selling a million physical copies of a single or a CD offsets the loss of millions of dollars in the art that created it. Worst of all, this manufactured stuff gets top billing in stores, radio and I-Tunes while “real” new music gets pushed to Indie web sites to be stumbled upon by accident. To help reinforce my point about the difference between real music and today’s manufactured material let’s do a quick comparison of #1 songs in the USA from the years 1982 and 2011. Entire Month of April 2011: ET (Katy Perry w. Kanye West) – No, it’s not about the little alien guy who ironically, first appeared in 1982. Thirty years from now, which songs will you still remember?